Weight loss can help improve your health if your doctor has indicated that you're overweight, but a 17-year-old boy or girl shouldn't obsessively restrict calories or over exercise. If you're subsisting on soda, fast food and processed snacks, your diet could use some cleaning up so that it provides more nutrition and fewer empty calories. Use a diet and exercise plan to create healthy habits that help you manage your weight for a lifetime. Before embarking on a weight-loss program, ask yourself why you want to lose. Realize that wanting to lose weight to match some ideal magazine image or movie actor isn't realistic or necessary. People are built differently; some have lithe frames, while others are more muscular and stocky. If your weight is healthy for your age, height and gender, significant weight loss isn't necessary. Improve the quality of the food you eat, avoid processed snacks and meals and get adequate exercise daily to boost your health, not just to get skinnier. Fad diets that severely restrict calories, limit entire food groups or ask for you to not eat for long periods of time should be avoided. These may deprive you of valuable nutrients necessary to proper growth and bodily function, and they can negatively affect your skin and hair. You may also lose weight in the short term, only to gain a lot more back in the long run. These diets don't teach you how to eat well or exercise healthfully either. Teens should not eat fewer than 1,600 calories per day. A weight-loss plan for a 17-year-old should start with cutting out non-nutritious, high-calorie foods, including soda, chips, baked treats, white bread and fried foods. When you're hungry between healthy meals, opt for fresh fruit, plain nuts, low-fat yogurt or whole-grain crackers. Carry these healthy snacks with you to school so you're not tempted by the vending machine or a quick trip to a fast food restaurant after the bell rings. Don't cut out every one of your favorite foods forever, but stick to just one serving on occasion, rather than every day. It's easy to choose healthy foods at mealtime. Fill one-quarter of your plate with a grilled, baked or broiled protein, such as chicken breast, tuna canned in water or tofu. Another quarter contains a whole-grain, which could be brown rice, 100-percent whole-wheat pasta or whole-wheat bread. Fill the rest of your plate with watery, fibrous vegetables, such as lettuce, spinach, peppers, broccoli, cauliflower, onions and carrots. Minimize dressings, butter and cheese toppings, but rely on olive oil, citrus juice, salsa and spices for flavor. Drink low-fat milk with meals or snacks to get calcium and vitamin D for your growing bones. 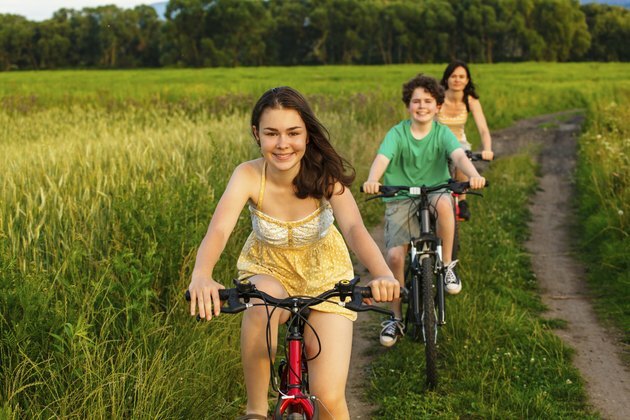 As a teen, aim to get a minimum of one hour of exercise per day. You could head to the gym or join a sports team. If structured exercise isn't your thing, use the hour to do a brisk walk, ride your bike or dance to your favorite tunes in your room. Choose a cardiovascular exercise that involves weight bearing to help strengthen your bones and do it at least three times a week. For example, if you're a competitive swimmer, you should still jog or hike as cross training. As part of this seven-hour-per-week minimum exercise routine, do some movement three times per week that requires strength -- such as pushups, pullups, flowing yoga, core exercises or gymnastics. This helps improve your muscular endurance and function. Plus strong muscles help boost your calorie burn and make you look healthy. Lifting weights is an option to promote sports performance and your overall health. Start gradually and consult your doctor before beginning a program to make sure it's right for you. You might also benefit from guidance from a fitness professional to learn the correct equipment and form for you. Sleep plays a significant role in your diet and exercise program. You may be inclined to stay up late, but this provides you with opportunities to snack on unhealthy foods and take in unnecessary calories. When you have to get up early the next day for school or weekend activities, you might resort to high-calorie energy drinks or sugary coffee drinks to perk you up. Too little sleep also increases hormones that make you crave high-sugar and high-fat foods. Sleeping fewer than eight hours per night puts you at three times the risk of obesity compared to those who sleep more, reported a review published in the Journal of Research on Adolescence in 2011. Stress affects a teens' eating behavior and physical activity. A 2014 issue of the Electronic Physician Journal published a paper noting that emotional stress leads to being overweight or obese for boys and girls. If you feel overwhelmed by school, social situations and family issues, watch how it affects your eating and exercise habits. Instead of reaching for food to make you feel better, consider going for a walk, calling a friend or writing in a journal.